As I am sure you are all aware, October is Breast Cancer Awareness Month. While I have not personally known friends or family affected by breast cancer, I know of many friends and acquaintances whose lives have been touched by breast cancer. In the lab that I work in as a graduate student, we study a variety of cancers. While my project specifically focuses on certain types of childhood and adult leukemias, others in my lab do study breast cancer. In addition, the drugs that I am currently studying in leukemias may on day be proven to be effective in other cancers, such as breast, in the future. In honor of the month, today I have for you pink rose nails. 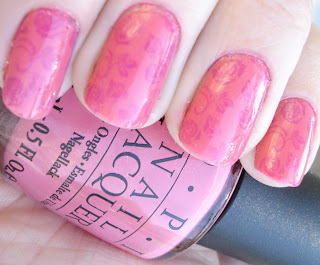 For these nails, I used three coats of OPI Chapel of Love, and I only needed the third coat because I was watching a movie and not paying much attention to application, and therefore had avoidable bare spots. 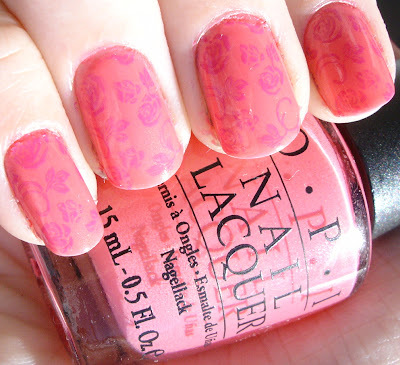 I used Konad plate m65 with OPI Ate Berries In The Canaries to put the darker pink roses on top. Then I finished it off with a coat of Seche Vite. To learn more about breast cancer, you can visit the National Breast Cancer Foundation (http://www.nationalbreastcancer.org/) or the Komen site (http://ww5.komen.org/). I will plan to do several more BCA posts during the month of October, in addition to fun fall and Halloween inspired nails!